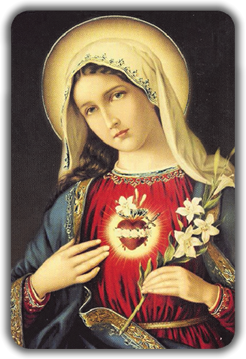 This is the message of the Mother of God. Her reminder is our best and only hope. 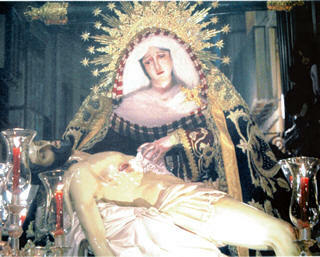 The treason of Judas was preceded by his contempt of the penitent Magdalene for her act of love in anointing the Feet of Jesus with costly spices. Jesus knew perfectly well that one of His Apostles would betray Him to His enemies for money. He lovingly washed the feet of Judas and longed to be allowed to wash his soul. The betrayal of Christ and the love of money are inseparably joined in our sacred history. If Judas sells Jesus, will I buy Him? He has loved me and delivered Himself up for me. Will I give all I have and all I am? Will I make Him mine at the expense of my pleasure and temporal happiness? In the Agony of Jesus in the Garden, He sweat blood. Raising His Eyes to Heaven, He prayed: “Father, behold the witness of my entire obedience to Thee, and of my devoted love for Thy children and My brethren.” Victim and Martyr, His Blood speaks louder than words. And Pilot said to them, “I find no guilt in Him” Yet, he chastised Him to satisfy the people. It was a brutal flogging, unlimited both in number and the severity of the stripes inflicted. As the steel strikes fire out of the flint, so did the whips spark the fire of Love from the Heart of Jesus. The harder they struck Him, the more He loved them, and loved all sinners. He answered the whips with darts of Love. Through this particular suffering, He was atoning especially for our sins of impurity. Let no Christian who has studied Christ’s scourging at the pillar ever again pamper his miserable flesh! Let him chastise his body and bring it into subjection by continually practicing, at least, some little acts of bodily self-denial. 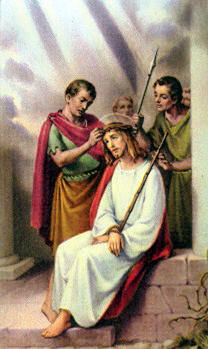 The soldiers crowned Jesus with thorns out of contempt for His divine sovereignty. The sin-infected earth brought forth thorns and briars, and sinners more savage than the earth crowned their Monarch with the sharpest insults. Let us love the crown of thorns because it plainly tells that, after obtaining forgiveness of his own sins, the chief glory of every Christian is to bear the shame of his neighbor’s sins. Christ’s coronation with thorns is a splendid victory over our pride, leading us to be subject to one another in all humility. Both the Cross and Crown He committed to us as a special heirloom of self-sacrifice and self-abasement. Father. To Him, it was not a shameful gibbet, but the chosen symbol of His tenderest Love. Still, it was hard for Him to carry this crushing load for His Body was totally spent through the terrible scourging He underwent. His physical strength might fail, but not His determined purpose. His courage never faltered. No matter how heavy our crosses, let us never lose courage. Let us say with the Apostles, “I can do all things in Him Who strengtheneth me.” Patience in affliction and under adversity brings peace in strife, solace in pain and, above all else, secure hope of the pardon for our sins. 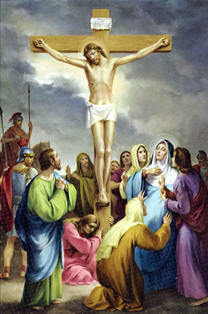 BEAR YOUR CROSS BRAVELY IN UNION WITH JESUS CRUCIFIED. Christ is our Teacher and our Pattern. His Example is the known and approved reasonableness of a mortified life. Oh, how many virtues flow into our soul ‘by looking upon Him Whom we have pierced: humility, patience, self- denial, obedience to the Divine Will and sacrificial love. Jesus kept Himself alive on the Cross by a miracle of fortitude. His Face lifted upward, and His fading Eyes gazed into the darkened Heavens, “Father, into Thy Hands, I commend My Spirit.” Jesus died. From the turmoil of Calvary’s horrors, the Soul of Jesus thus passed into the tranquility of the Godhead. Christ died for sinners, of whom I am the greatest. To care not why the Son of God suffered Himself to be put to death, is for the Christian a capital sin of sloth. The charity of Christ presses every love into its service, and places itself at the service of every love. The Son of God died for my salvation! I commend my spirit, unreservedly and forever, to be owned and ruled by Thy Spirit in all things. O, what in all life is so precious as the privilege of bowing down one’s head and dying for sinners! If the disciples of Christ preach rigors, it is no compliment to their Master Who preached pardon. From among all actions calculated to win souls, Christ chose to die for men that they may have life everlasting. Mary, John and Magdalene and the other faithful women stood alone at the foot of the Cross of Christ. A party of soldiers from the city was sent by Pilot to break the legs of the convicted and remove them from their crosses. Jesus was obviously dead but a soldier pierced Him with a lance. It struck Him hard and made a great wound clean to the heart, wide as a man’s hand. After that stroke, no hand touched Jesus but in love. Jesus suffered in all His bodily frame; His Feet were pierced that blood might mark His tracks as He searched zealously for our souls; His brain was tortured by a thorny crown that His thoughts might trickle blood as they ached and throbbed for us, and now His Heart, the very organ of love, receives the deepest cut of all, drained so generously in atonement of our sins. If our gaze upon the Crucified Savior can put a touch of pain in a sinner’s heart, He has won that heart. The gaping side of Christ is that open door from whence the Sacraments of the Church flow forth, without which there is no entrance to true life. O God, Who guidest that which is gone astray, and gatherest that which is scattered, and keepest that which is gathered together, we beseech Thee, mercifully pour forth upon the Christian people the grace of Thy unity, that they may reject the spirit of dissension and unite themselves to the True Shepherd of Thy Church, and may thus be enabled to serve Thee worthily. Through Christ Our Lord. Amen. Have you Loved Ones who have strayed from the Sacraments, a spouse who is unfaithful, children who are abusive and disobedient, sick ones who are in anguish, crushing financial worries or unbearable burdens at the workplace? Make haste to bring them to the Fountain of Life, and bathe them in the Most Precious Blood of Jesus Christ! During this Holy Season, enrich your family spiritually by enrolling your parents, spouse, children and friends in the Lenten Mass Bouquet we are privileged to offer to you. By hearing Mass, you afford the Souls in Purgatory the greatest possible relief. One Mass heard by you, during life, will be of more benefit to you than many heard for you after death. 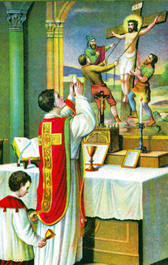 Holy Mass preserves you from many dangers and misfortunes that would otherwise befall you. You shorten your Purgatory by every Mass. You win for yourself a higher degree of glory in Heaven. At Mass, you kneel amidst a multitude of angels who are present at the adorable Sacrifice with reverential awe. You receive the priest’s blessing which Our Lord Himself ratifies in Heaven. You are blessed in your temporal goods and affairs. The names you send for individual enrollment for the Sacred Masses during the Lenten Season and Easter Octave will be placed upon the Altar. Fr. Ivan Kolodiy and all the priests you have helped in Ukraine will offer these Masses. Mass cards will be provided for the persons enrolled. This entry was posted on Wednesday, February 1st, 2012 at 9:28 pm and is filed under NewsFlash, Saint Philomena. You can follow any responses to this entry through the RSS 2.0 feed. Both comments and pings are currently closed.